Home and Away did 742,000 after 783,000 on Monday night. Episode three of Hell’s Kitchen Australia was centrepiece of a food night on Seven. Contestants Pettifleur and Willie Mason had to share one oven to prepare their main course leading to some tense moments in the kitchen and lots of smoke and steam. Marco decided to put Pettifleur into the elimination telling her, “You didn’t push, you weren’t a team member tonight.” The Tuesday audience was up marginally on the Monday numbers. Ramsay’s Kitchen Nightmares followed with the chef heading to Denver for the 413,000 viewers. 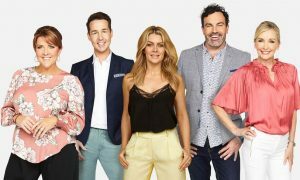 The final episodes of Yummy Mummies signalled the end of the programming experiment with audiences of 225,000 and then 170,000 for the last hurrah which ended close to midnight. Woolies overcharging, dumb car hoons and money laundering were among the topics on A Current Affair with 933,000 watching after 963,000 on Monday. Scotty took out the contestants on The Block for a drink and a feed at their local last night after a day on construction inside the properties and outside as a build was under way at the rear of the properties too. After 1.09m on Monday, the Tuesday episode did 1.0m. True Story this week found a real-life character called Phil who boasted David Attenborough has never seen anything like he had. Among the cast was Mick Molloy, back on Nine, playing a dodgy Gold Coast travel agent. The episode did 905,000 after 720,000 last week. Two episodes of Kath & Kim followed with 538,000 for the first and then 438,000 for the second. The Project might not be getting Michael Pell, but the show did feature Tommy Little and Fifi Box on the desk plus Dannii Minogue as a special guest. The episode was the channel’s only show over half a million last night, but only just with 503,000. Shark Tank was not far behind with 477,000 in the earlier timeslot of 7.30pm after 440,000 later in the night on Tuesday last week. There was some protracted negotiating last night and the episode ended with a marriage proposal. NCIS returned to the 8.30pm timeslot with episode 20 of season 14 doing 406,000. A repeat episode followed with 286,000. The House with Annabel Crabb was a hit at 8pm with 659,000, which featured external and internal drone footage of Parliament House in Canberra. The timeslot audience was up 250,000 on the number watching Ask The Doctor last week. The ABC production was directed by Stamatia Maroupas who also worked with Crabb on Kitchen Cabinet. The AI Race doco at 8.30pm explored how artificial intelligence will change your job. The show did 387,000 and was followed by The Farthest, the first of two episodes about NASA’s Voyager mission, with 257,000 watching. Michael Portillo was back at 7.30pm with the return of Great American Railroad Journeys. The episode featured a trip from St Louis to Jefferson City with 329,000 watching. An episode of Insight on commitment then did 216,000.